A master showman whose films are more accomplished and entertaining than the gimmicks he used to sell them might suggest, William Castle's time at Columbia was career-defining, and four of his films have been packaged with tons of special features into WILLIAM CASTLE AT COLUMBIA, VOLUME ONE, a glorious Blu-ray box set from Indicator. Slarek looks through his Ghost Viewer with undisguised glee. I can't be certain when I first learned about producer-director William Castle, but have a feeling it was through that late friend of mine who intermittently gets referenced in my reviews. I certainly remember his amusement on discovering the gimmicks that Castle had dreamt up to accompany and draw the curious to screenings of his films. 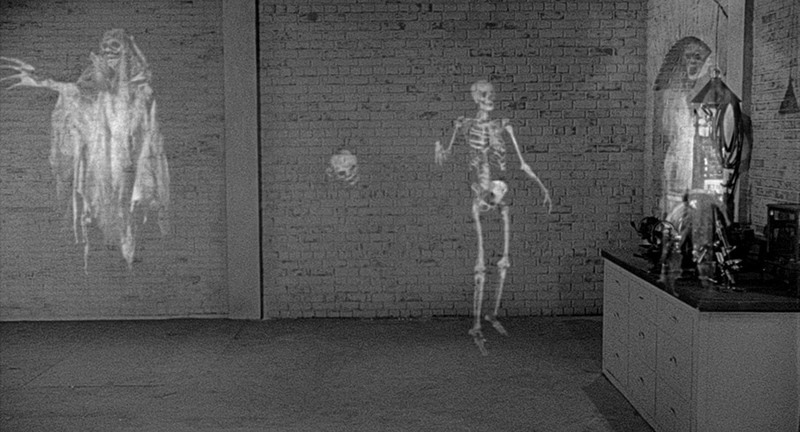 The one that really cracked him up was 'Emergo', a process employed by Castle to promote his 1959 House on Haunted Hill and which consisted of nothing more than a plastic skeleton that was trundled over the heads of the audience at a key moment in the film. If you're a horror film devotee of a certain age, then you'll likely know the name of William Castle well. If you're somehow unaware of his colourful approach to film promotion, you won't have to look far to find all you need to know. If you want to be thoroughly entertained in the process of this research, then take a look at Joe Dante's Matinee, in which a lively John Goodman plays a character closely modelled on Castle as he sets up the insanely complex devices used to freak out the audience during screenings of one of the very films under discussion here. While opinions tend to vary on Castle's merits as filmmaker, there's no disputing the fact that he was a master showman, one whose creatively outlandish sales gimmicks are almost more famous than the films they were designed to promote. Castle was the P.T. Barnum of horror cinema, a circus ringmaster who devised and directed his own shows and sometimes even provided cheerful to-camera introductions, making it clear that what the audience was about to watch was the cinematic equivalent of a ghost train ride. But as this wonderful box set ably demonstrates, he was much more than that, and clearly knew how to spin an engaging and sometimes genuinely gripping tale with the minimum of cinematic fat and flourish. I'd also argue that he was a better director of actors than he's generally given credit for, something you'll find evidence aplenty of in the films in this set. Many of Castle's most talked-about films were made at Columbia, four of which are included in this Indicator box set, with a second quartet due to follow in December. As ever with Indicator multi-film collections, there's a lot of content here and a good deal to discuss, which as ever is why this review has taken so long to complete. 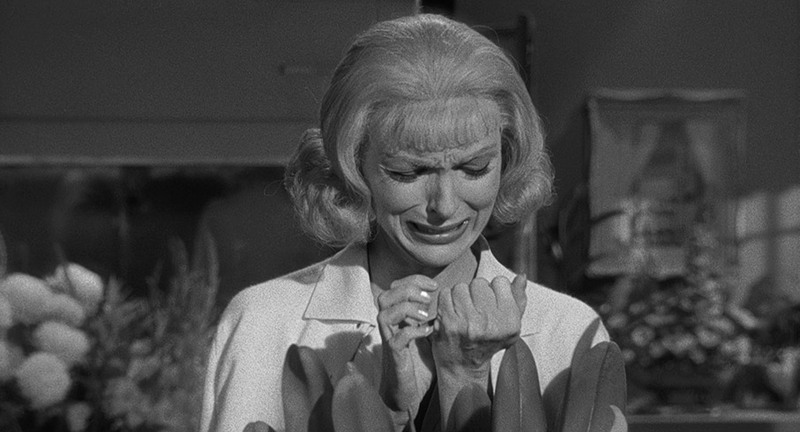 For anyone who knows William Castle by reputation only or through one of his lesser works, his 1959 The Tingler has a number of very real surprises. Following Castle's customary introduction – during which he occasionally looks like he's trying to suppress his amusement at the jape he is about to pull – we're treated to a loud montage of screaming faces, one of which dissolves into that of a terrified convict as he is led to the electric chair. The first surprise is that we don't witness his execution. One man who does is Oliver Higgins ("most people call me Ollie"), the brother-in-law of the executed man, who for reasons that never really become clear (but which you'll later find yourself speculating on) also then attends the man's autopsy, which is being conducted by Dr. Warren Chapin, played by genre favourite Vincent Price. The second surprise is how low-key and almost naturalistic the conversation that unfolds between them proves to be, with Price in particular discussing what he believes to be a physiological manifestation of fear – one powerful enough to crack the vertebrae of its victim – in a manner that makes this preposterous theory sound anything but. Even the potentially daffy moment when he decides to name this unknown force 'The Tingler' after an offhand comment from Ollie is convincingly sold here. As the two men head off, Ollie asks Warren for a lift into town, and he happily obliges. Ollie, it turns out, runs a specialist cinema that screens silent films, one owned by his deaf-mute wife Martha, a nervous germaphobe who faints on the spot when Warren accidentally cuts his finger after being invited in for coffee. Her condition prompts Warren to wonder what would happen if someone such as she was to be given a terrible fright but was unable to relieve the tension by screaming. Surprise number three is that he doesn't follow through on this and experiment on the unfortunate Martha to see what happens. Or does he? We're kept guessing by a return visit on his part to check on Martha's condition and what subsequently happens to her. But all is not what it initially seems to be here. When Warren arrives home, he is greeted by his young and attractive sister-in-law, who is dating Warren's talented junior colleague, David Morris, a union that Warren heartily approves of. 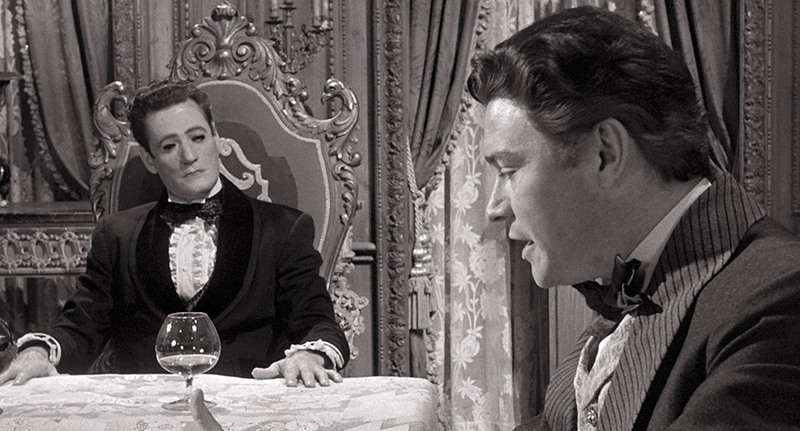 Lucy informs Warren that his wife Isabel – who is also Lucy's sister and disapproving guardian – is out on the town again, the latest in a series of nightly infidelities that Chapin (surprise number four) is wearily accepting of, regarding it as an inevitable consequence of the long hours he devotes to his research. Warren, it would seem, is a decent man. Yet when Isabel does arrive home later that evening, after kissing her latest flame goodbye right outside the house, the conversation between her and Warren is barbed, and Warren even makes a veiled threat that seems a little out of character, at least until... ah, now that would be telling. There are several even more surprising twists over the course of the next half-hour, and it's only when you take a step back that you start to realise how bereft of logic a couple of them are. Chief amongst these is an eye-popping sequence of what appears to be a drug-induced nightmare, a series of startling apparitions (including a bathroom in which the water is transformed into bright red blood in an otherwise black-and-white film) that have a serious impact on the unfortunate victim, and whose conclusion delivers a most effective surprise but leaves you with a slew of questions about how it could possibly have… no, it would be unfair to spoil this one. That Castle is able to sell this at all is down primarily to a terrific lead performance from Vincent Price, whose low-key sincerity as Warren somehow sells the pseudo-scientific claptrap that he spouts as oddly plausible, and even when he lets rip during an experiment involving a self-administered drug – cinema's first ever on-screen LSD trip, no less – there's such conviction to his histrionics that his pain still registers convincingly enough to undercut the unintended giggles. He even managed to convince me that the physical manifestation of the Tingler – which looks like a rubber cast of the oversized offspring of an earwig that has been mated with a lobster and is often pulled around on visible strings – was a living organism just by the way he holds the damned thing as it clings to his arm. But he's not alone here. As Warren's unfaithful wife Isabel, Patricia Cutts is just terrific, particularly in the couple's verbal sparring matches, while Judith Evelyn plays nervous mute Martha almost as a reflection of the silent films in which her little cinema specialises. Of course, the thing that The Tingler became instantly famous for is 'Percepto', which was without question the most elaborate of Castle's gimmicks and one I and many of the contributors to this disc remain astonished that he was able to pull off. For those who do not know, Castle would prepare for screenings of the film by have venue staff fit electric motors to the underside of a select number of seats. 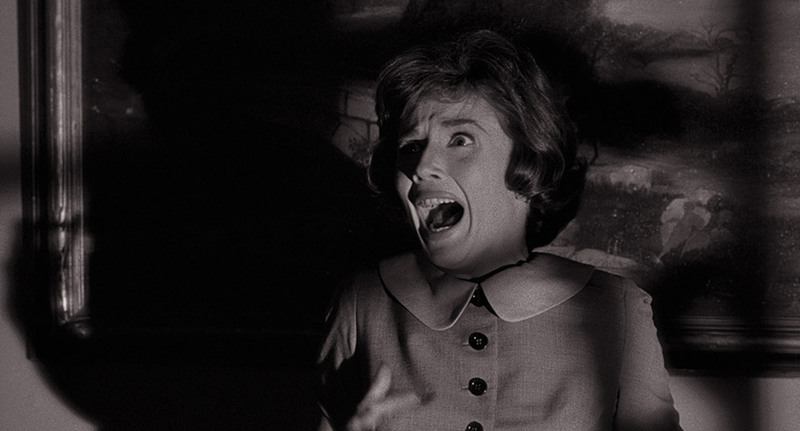 At a point in the film where the Tingler gets loose in Martha's cinema, the screen turns black and Price warns everyone that the only defence against it is to scream your head off. On the original screenings, the projectionist would then hit a button and those audience members sitting on the wired-up seats would get what felt like a small electric shock. Apparently, pandemonium would result, as those affected jumped and screamed and set everyone else off, something the audience would already geared-up for, as just a few minutes earlier a stooge planted in the audience would have screamed and fainted and been carried out of the cinema by women dressed as nurses. Obviously, this is an experience that even the most comprehensive Blu-ray release cannot hope to emulate, but if you want to get a flavour, get your hands on something that vigorously vibrates (I'm judging no-one here), sit on it and then have someone turn it on unexpectedly during this sequence. I should say that I've yet to try this. A handsome 1.85:1 1080p restoration from Sony, one whose monochrome image displays a generous tonal range without ever sacrificing the integrity of the black levels. Detail is crisp enough to highlight the texture of materials and allow you count the bricks on buildings if you so wish, and there's a fine film grain visible throughout. 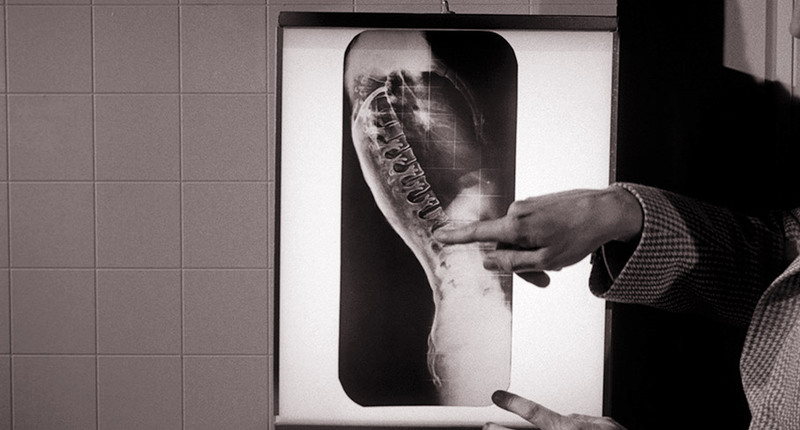 This coarsens and the image softens a little during the bathroom sequence where the water turns blood-red, but this is undoubtedly down to the process work involved (it is noted in the booklet that this was scanned and restored by Final Frame Post in London, and this is the first time that this sequence has been restored from 35mm materials). Dust and damage has been banished throughout. The Linear PCM mono soundtrack has some minor limitations on range when it comes to the dialogue and effects, but is always clear and the music is surprisingly robust throughout. There is no trace of damage or distracting background hiss. English subtitles for the deaf and hearing impaired have been included. Having previously teamed up for the excellent commentary on Indicator's Blu-ray release of The Mind of Mr. Soames, the knowledgeable duo of Jonathan Rigby and Kevin Lyons are on equally fine if more jovial form here, as they cheerfully discuss and intermittently poke fun at a film that they both clearly have a great deal of time for. They salute the casting, the dialogue and the chemistry between the actors, reveal that the cinema featured in the film is based on an actual venue, and find interesting links to Jack Sholder's too-often undervalued 1987 action-horror The Hidden. I was intrigued by the fanciful idea of a David Cronenberg remake (albeit The Brood and Rabid-era Cronenberg, which would require some time travel) and their claim that there are few genuinely likeable people in the film and that Warren is a rather nasty piece of work. I'm not the only one who disagrees with them, on this. Genre writer and novelist Kim Newman notes up front that as just about everyone who discusses The Tingler tends to focus on the 'Percepto' gimmick, and that he instead intends to concentrate on the film, which he describes as "strange enough on its own terms to be a bizarro masterpiece." He praises Patricia Cutts' performance, points out that there were no other films with ideas like these back in the late 50s and early 60s, and acknowledges that Castle had a crude pulp vigour and was good with jump scares. He does, however, also highlight elements that make no sense in character terms and suggests it plays like a film made by scientific illiterates. Intriguingly, he disagrees with Kevin Lyons and Jonathan Rigby's dim view of Price's character by suggesting that he's the most decent person in the film, and kicks against their high praise for Rob White's script by describing it as so hard-boiled and so ludicrously over-the-top tough that you can't help but laugh at it. Fight! A brief interview with actor Pamela Lincoln, who plays Lucy, framed 4:3 and sourced from an earlier DVD. She remembers Castle as a quiet and considerate director and Vincent Price taking the job as seriously as he would a prestige drama, and notes that it has been revived a number of times since and has become something of a cult film over the years. Barry Lorie from the Columbia Pictures publicity department recalls having to take a box of buzzers to cinemas and convince managers to fit them to seats. He echoes the memories of others on this disc by assuring us that it got audiences screaming and laughing and spreading the word to others, as well as ensuring write-ups in the press. This is a 4:3 framed featurette imported from an earlier DVD release. Another imported former DVD extra, this featurette is built around interviews with actor Daryl Hickman, 'monster enthusiast' Bob Burns, author Lucy Chase Williams (whose works include The Complete Films of Vincent Price) and film historian David Skal. The film and its making is discussed here as is – inevitably – the Percepto gimmick, but the most entertaining stories come from Bob Burns, who recalls dressing up with his wife to present a visiting William Castle with a Skeleton Key to the city (there's even footage of this) and the pandemonium that unfolded in cinemas when Percepto was unleashed. Like many of the imported extras in this set, this was compiled by Jeffrey Schwarz from material he shot for a documentary you'll find on the second disc in this set. An audio-only recording of the funniest horror song this side of the main theme to The Blob, plus some verbal warnings from Vincent Price. Apparently this was played in cinema lobbies. If the dialogue annoys you, select this and you can watch the film with the music and effects only. Following the expected introduction from Castle, who only hints at the true nature of Percepto, we're treated to a number of alarming extracts from the film, and plenty of screaming. It seems only appropriate that director Joe Dante should provide the commentary on this Trailers From Hell entry, given that his own Matinee draws heavily on Castle and the very gimmick employed to sell this film. Having met Vincent Price, Dante suggests his performance here is as close to his real personality as any in his career, but also states that the film has "surely one of the most preposterous plots ever conceived." 32 slides of promotional stills (including a couple of spoilers), press material and colourful posters. Detailed instructions on how to fit the 'Percepto' buzzers to cinema seats. If you should find one on eBay, you'll be sorted, but people have tried and failed in this quest. Each of the films here comes in its own regular Blu-ray case within the box set and each features a reversible cover and a separate booklet in the manner of a stand-alone release. All of these booklets open with credits for the film in question and brief information about the restoration at the end, and all are illustrated with stills and artwork relating to that title. 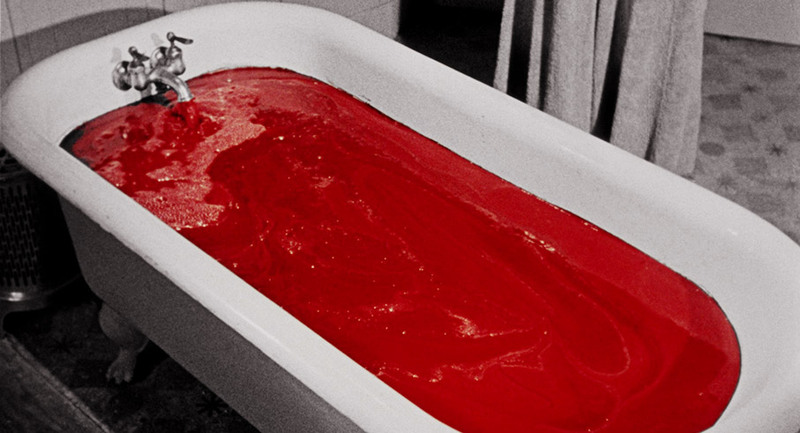 The meat, of course is in the rest of the content, which kicks off here with an authoritative essay on The Tingler by Kat Ellinger, which is followed by a piece on the restoration of the colour bathroom sequence by Michael Hyatt, an extract on the making of the film from William Castle's autobiography, Step Right Up! I'm Gonna Scare the Pants Off America, reproductions of material relating to the Percepto gimmick, and extracts from three reviews of the time. Palaeontologist Cyrus Zorba is not good with money. Despite holding down a steady job at the Los Angeles County Museum, he's once again failed to pay the instalments on his furniture and is in the middle of lecturing to a group of museum visitors when he wife Hilda phones to tell him that removal men are currently at the house and stripping it of its chairs, tables and carpets. Never mind, it's their young son Buck's birthday, and that evening Buck's older sister Medea encourages the boy to put down the book of ghost stories he's absorbed with and make a wish before blowing out the candles on his birthday cake. Buck goes for the practical and wishes they had a house with furniture that nobody could take away from them. Seconds later, a man with the countenance of a living ghoul shows up at their door with a telegram informing Cyrus that his presence is requested at the office of attorney Benjamin Rush the following morning. Here Cyrus is informed that his uncle Plato has died and has willed his large and well-furnished house to his nephew. What are the chances? They soon learn, however, that the house comes with a few unexpected extra features in the shape of stony-faced housekeeper Elaine Zacharides, a collection of ghosts captured by late Uncle Plato, and a device that allows its wearer to see these unhappy spirits. In some ways, 13 Ghosts lays out a template for a plethora of haunted house movies to follow and particularly the resurgence of them in recent years, all of which seem to begin with a family moving into a house that they've either bought on inherited, and then being pestered by the restless spirits of people who died in unpleasant circumstances. 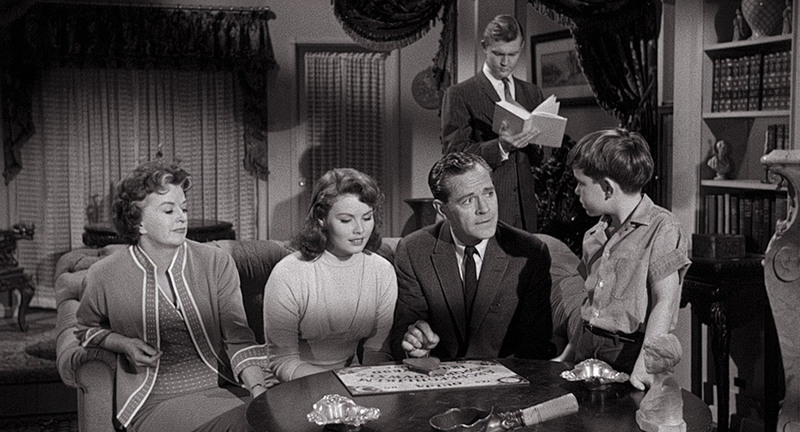 There's even a scene here that has been repeated ad infinitum but subsequent genre movies when someone discovers a Ouija board left by the previous owner and the family think it will be fun to give it a go. Here, however, it gives rise to what is probably the creepiest moment in the film, when Medea follows up Buck's question about how many ghosts there are with a riskily pertinent, "Are they going to hurt us?" and the planchette slides over to the word 'yes' and then rises up to indicate precisely who. 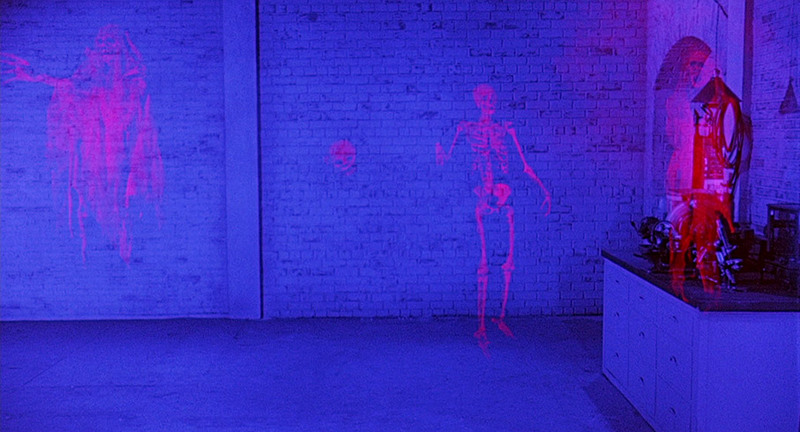 The idea that Zorba was experimenting with the paranormal has also been recycled since as a trigger for ghostly activity, but the notion that he was able to capture and imprison spirits in a locked and shielded room his house was, as far as I'm aware not, revisited until it was turned into a paying business in Ghostbusters. The gimmick employed by Castle here was named Illusion-0 and provided audience members with a souvenir of the screening that has since become a treasured collector's item. As they entered the cinema, patrons were handed something called a 'Ghost Viewer', a cardboard construction with two oblong windows, one containing blue gel and the other red. 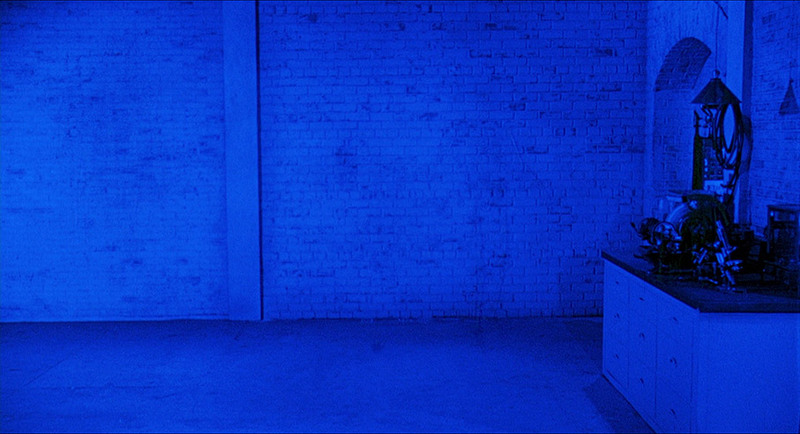 During sequences in which the ghosts are viewed through Plato's bequeathed device, the screen turns blue, and by looking through the red gel the ghosts would clearly visible, but would disappear completely when watched through the blue gel. Since no-one going into a film titled 13 Ghosts is likely to want to avoid seeing the title apparitions (and if for some reason you do then simply closing your eyes has been a long-standing option), the fun comes from shifting backwards and forwards between the red and blue windows to marvel at the way you can make the ghosts appear and disappear, which has proved something of a problem for home video versions of the film. Obviously, the best way possible would be to present the film in its Illusion-O version and include a recreation of Castle's Ghost Viewer, which would allow us to experience the film as audiences did back in 1960. As far as I am aware, however, no disc distributor has had the funds or the chutzpah to go this far. 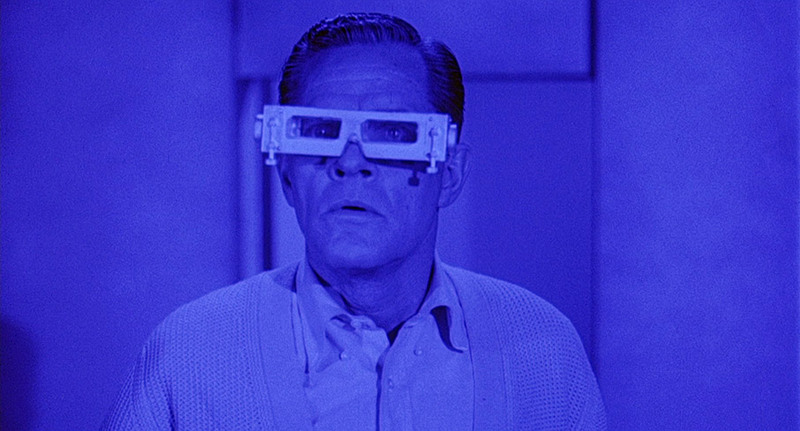 Compromise solutions have included providing blue and red gelled glasses, which have the same effect, or two versions of the film, one in which the ghosts are visible and one in which they are not. Indicator have gone almost the whole hog here, including not only alternate versions in which the ghosts are visible and invisible, but a completely black-and-white version with no tinting on the ghost scenes (you can see the ghosts here), and the Illusion-O original, presumably for anyone who fancies rigging up their own Ghost Viewer from, say, a couple of pairs of old-school cardboard 3D glasses that they might have hanging around. That's certainly what I did, and I can't really explain the irrational thrill I got when it worked. The ghosts, it has to be said, aren't really up to much, being translucent puppets or costumed humans and animals (and quite why a lion's midriff is invisible is beyond me), while the hat and preposterous handlebar moustache of the otherwise faceless Italian chef Emilio, who re-enacts the murder of his cheating wife, looks a little too like the Swedish Chef from The Muppets for me to take remotely seriously. Then again, from the way he behaves I'm not sure we're really meant to. The ghosts are at their best when they are not visible at all and take to moving objects around and causing general mayhem in what I presume was a blend of trick photography and wire work that even in high definition looks far better than you might expect for a film of this vintage. Elsewhere, a more solid incarnation of one of the spirits is quite effective, but different enough to the other spirits in the house to have me instantly suspecting that not all was what it seemed here. Yet there are still enough engaging character moments and surprises (including one involving a key player in the story and some effective misdirection) to not only hold the interest, but make 13 Ghosts more fun than many of the po-faced and cliché-peppered haunted house horrors of recent years. Buck's casual acceptance of the presence of the ghosts and understanding of their history and behavioural patterns is rather neat, and the scene in the ghost of Emilio invisibly smashes up the kitchen is made to feel like one from a more recent film by the fact that Hilda responds not with terror but end-of-tether frustration, and wants to leave the house not through fear because she's fed up with this rambunctious behaviour. There's something of a consensus amongst the contributors to this set that 13 Ghosts is the weakest film in this set and the one most obviously aimed at Castle's beloved 8-14 year-old demographic, and you can read what you like into the fact that it is the only one of the four not to have an audio commentary (no volunteers?). But it's still a lot of fun, and I'll enthusiastically second those on this disc who admit that had they seen it as a kid, they would have adored it. 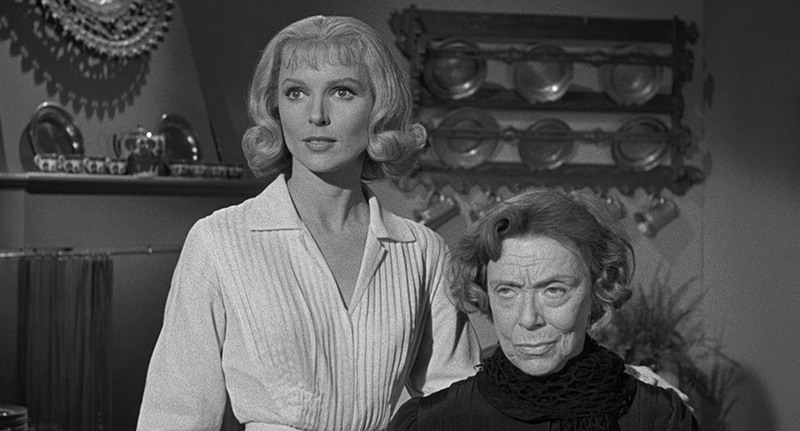 As an adult, however, I smile the widest at the decision to have stern housekeeper Elaine Zacharides – whom Buck believes is a witch and probably is if the film's audience-wink ending is to be believed – played by Margaret Hamilton, whose most famous screen role was the Wicked Witch of the West in The Wizard of Oz. Another strong 1.85:1 1080p transfer with the sort of deep blacks you want for the shadows in a haunted house film. The contrast feels a whisper stronger than on The Tingler and the film grain just slightly more visible at times, but both look right for the film. Damage and dust has all been removed and the picture stabilised so that there is no movement within the frame. As mentioned above, the disc includes four different ways to watch the film, which I presume was achieved through branching as it's hard to imagine cramming four feature films onto one disc and keeping the bitrate high. 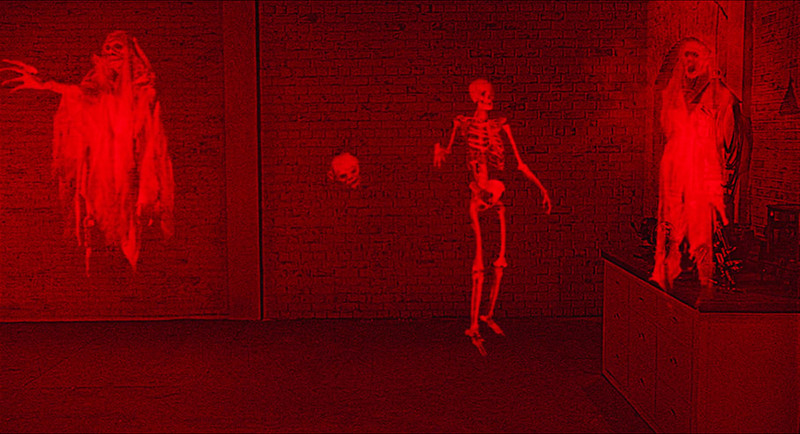 There's the Illusion-O version, in which you can just about see the ghosts, which become more clearly visible (or can be made to disappear) with a home-made Ghost Viewer. Alternatively, you can watch the film as it would appear if you were looking through the Ghost Viewer during the tinted sequences, and whether you can see the ghosts or not depends on which version you watch. Finally, there is a purely black-and-white edition for those who don't want the distraction of the screen suddenly turning bright red or blue. Here the ghosts are always visible. The colour in the Illusion-O sequences is vividly rendered and accurately so – the Ghost Viewer wouldn't have worked if the tinting had been off, but it really does. Dialogue is always clear on the Linear PCM mono 1.0 soundtrack, as are the groans of the ghosts and the other assorted effects. Music once again is particularly well-rounded. English subtitles for the deaf and hearing impaired are on board, as expected. A lively and energetic feature-length celebration of William Castle the filmmaker, the showman and the all-round decent human being, made as a passion project over the course of several years by director Jeffrey Schwarz and his friend and editor Philip Harrison. Built around a wide range of interviews with family, friends, associates and fans – some of whom such as Joe Dante, John Landis and John Waters also went on to become filmmakers of note – it moves a lick (there are precious few still images that haven't been treated and animated in some way) and covers so much ground that you made need a second viewing to take it all in. 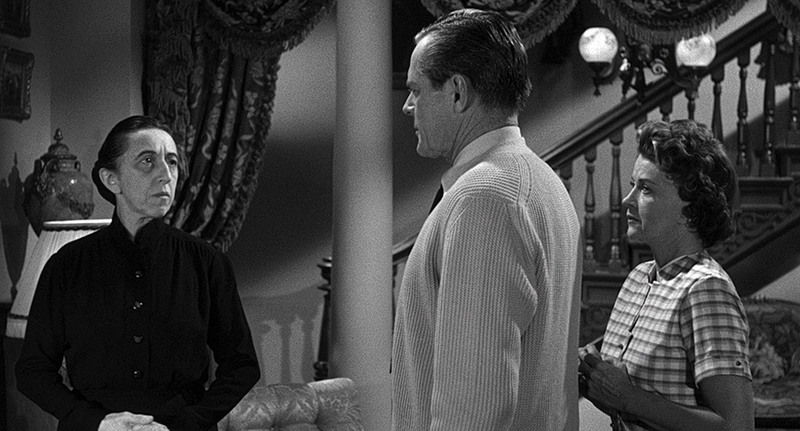 The films and their associated gimmicks and promotion get appropriate coverage, as does Castle's early work in theatre and his initial disappointment at not being allowed to direct Rosemary's Baby after mortgaging his house to pay for the book rights before anyone else in Hollywood had an inkling of what a hot property it would become. It's packed with engaging stories and anecdotes, but of all the quotes here, the one that widened my eyes the most was director Budd Boetticher's remarks about authoritarian studio boss, Harry Cohn, from whom Castle learned seemingly everything had needed to know about the movie business: "Harry Cohn was probably, except for Hitler and Mussolini, the most frightening and despicable man you ever saw in your life." Ouch. I'd suggest this was the perfect introduction to Castle and his movies, but there are a couple of major spoilers in here for films in this set, so I'd save it for after the features themselves. It should be noted that the archive DVD featurettes that appear on all four discs in this collection were also produced by Schwartz and compiled from material shot for and sometimes used in this film. A commentary for a documentary celebrating the life and work of a filmmaker? I wasn't sure about this one, but quickly warmed to it when I realised that it featured not just director Jeffrey Schwarz but William Castle's daughter Terry, one of the liveliest interviewees in the documentary and someone who is every bit as passionate about his work as Schwarz. Between them they have more than enough stories to make this an essential listen, from the specifics and difficulties of getting the film made to the personal angle that Terry – who loves the film and even chokes up at one point – is able to bring. I don't know why, but I got a special thrill out of hearing that Castle was a big fan of The Exorcist, and was intrigued to learn that he was due to direct Neil Simon's biting satire The Out of Towners, but had to drop out due to illness (the job went to Arthur Hiller instead). A slickly assembled and pacey making-of featurette in the style of the film itself, also directed by Jeffrey Schwarz and built around interviews with him, editor Philip Harrison, graphic designer and animator Grant Nellessen, and composer Michael 'The Millionaire' Cudahy. I'm not taking the piss, that's what he calls himself. Another of Schwarz's DVD featurettes that provides an overview of the film and its promotion and features interviews with Bob Burns, film historian Don Glut, Columbia Pictures repertory Michael Schlensinger and movie director Fred Olsen Ray. Glut's memories of meeting William Castle as a child and being one of 13 kids employed to ride around town on a float in Hallowe'en costumes to promote the movie are probably the most engaging. William Castle fan Stephen Laws contributes to the consensus that 13 Ghosts is a lesser Castle movie by not enthusing over it to the degree he does with the other films in this set but instead calling it "interesting," a favourite word employed to describe something you're not excited by but don't want to be seen as dissing. He remembers it being almost impossible to find as a young horror enthusiast and not catching it until it came out on video years later, and while he suspects he would have adored it as a kid, as an adult he sees it as a carnival film tailored primarily for a younger audience. We get some brief but interesting information on a couple of the cast members, and an extraordinary story about how Rosemary DeCamp (who plays Hilda Zorba) was nearly killed when an experimental plane being flown by Howard Hughes crashed into her next door neighbour's house. An audio piece played in the lobby of cinemas screening the film, complete with a cheerful announcer, part of William Castle's address to camera from the trailer, extracts from the film and lots of screams and groans, including one that sounds like Homer Simpson suffering from chronic indigestion. I was particularly amused to hear the announcer say of the Ghost Viewer that "It turns ghosts on, it turns ghosts off." All right, then. Groans, clanks, screams and music without the distraction of dialogue. 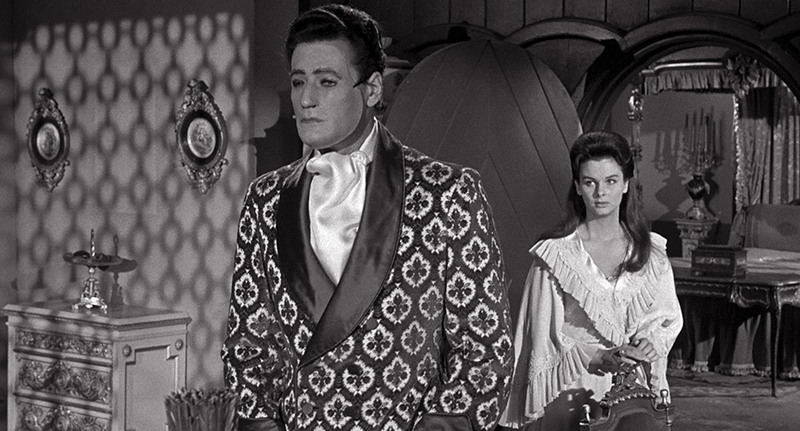 William Castle provides a deadpan introduction (and speaks to a skeletal secretary) in this unsurprisingly carnivalesque sell that focusses on the Illusion-O process and the Ghost Viewer. Screenwriter Sam Hamm (Batman, Batman Returns), who like seemingly everyone in every extra on this disc owns an original Ghost Viewer, remembers hassling his mother to take him to see the film at a very young age and then freaking out and having to be taken out of the cinema when the Ghost Viewer didn't conceal the spectral creatures that fly towards the camera during the title sequence. Then again, it wasn't meant to. 43 slides of photos and sometimes lively press material, including some staged shots of William Castle with fans waving placards, some of which relate to a pro-John F. Kennedy stunt and include the amusing slogan, "Let's put a Castle in the White House." The lead essay here is one on the film and Castle's approach by Dan Whitehead, which is followed by another extract from Castle's autobiography, this one relating to the production of 13 Ghosts. Next up is an entertaining 1960 piece by radio host and newspaper columnist Cedric Adams titled A Séance with William Castle, after which there are a number of contemporary reviews, plus a more recent recollection by Castle devotee John Waters. Finally, we have credits for Spine Tingler! and a brief biography of its director Jeffrey Schwarz. If you were grading the films in this set by the intrigue of their opening 15 minutes alone, then Homicidal would leave its companions standing, and if you're looking to be as startled as I was then I'd skip this review, avoid reading any other synopses (you can't really write one without spoiling this early surprise) and just watch the film. For the rest of you, here's how the story begins. Attractive blonde Emily checks into a hotel and specifically requests that younger bellboy Jim Nesbitt carry her bags to her room. She asks him if he is married and when he confirms that he is not, she offers him $2,000 if he'll marry her the following evening, a marriage that she assures him will be immediately annulled. Bemused by the request but figuring that it's an easy way to make some two grand, Jim agrees and dutifully keeps the midnight appointment. Emily has selected a specific justice of peace named Alfred Adrims to perform the ceremony, and when they reach his house, Emily offers an inflated fee as compensation for bothering the man and his grumpy wife at this unholy hour. The process takes less than a minute, and just seconds after the two are officially wed, Emily pulls out a knife and repeatedly stabs Adrims in the stomach, then flees the scene, leaving the shocked Jim in the company of the man's distraught widow. Even today, it's a genuinely shocking moment, in part because it seems to come out of nowhere but primarily because of the violence of the assault, with Adrims stabbed repeatedly and viciously by Emily, soaking his stomach and her right hand in blood. In one respect this serves the same function as the early head explosion in David Cronenberg's Scanners, delivering an up-front shock that makes it clear to the audience what could happen to anyone foolish enough to cross the antagonist, one that then hangs ominously over every subsequent scene in which she appears. After switching cars in what was clearly a carefully pre-planned getaway, Emily heads back to the house in which she lives and acts as a private nurse to the elderly Helga, who has been paralysed from the waist down and left mute by a stroke. The only way she is able to express herself, apart from a frightened facial expression that no-one who matters seems able to pick up on, is by banging a brass gavel on the arm of her wheelchair. Swap the gavel for bell and you've got Hector Salamanca of Breaking Bad and Better Call Saul. Helga is clearly terrified of Emily, who on her return grabs the old woman's wheelchair and distresses her further by gleefully hissing into her ear, "Adrims died tonight...screaming!" Seemingly oblivious to Helga's torment are Miriam Webster, who runs a local flower shop and has just become engaged to good-looking pharmacist Karl, and her brother Warren, who lives in San Diego but is close to Helga and regularly comes to town to check in on her and his sister. Both are heirs to their parents' considerable estate, but their misogynist father has stipulated that the whole thing should go to Warren on his fast-approaching 21st birthday, and the inheritance will only fall to Miriam if Warren should die before he marries. Emily is repeatedly frosty with Miriam, and when the police turn up at Miriam's shop asking questions about the murder and reveal that the killer used her name to check in to the hotel, she starts having real concerns about Helga's nurse. There's a lot worth talking about in Homicidal, but to do so would mean spoiling a late-film twist that genuinely sideswiped me, one that that I later reasoned I should have seen coming but absolutely did not. The clues are all there, seemingly hiding in plain sight, but actually are so well camouflaged that even a second viewing failed to highlight one "but of course!" moment for me. There's a strong temptation to throw out a spoiler warning and advise those who haven't seen the film to skip to the next paragraph so that I can get into the how and whys of why this was so effective, but many potential purchasers of this box set will be as new to the film as I was, and I don't want to risk accidentally ruining things for them. A discussion for a separate article, perhaps. What I can talk about is Emily, who makes for a consistently intriguing antagonist, one who appears to be battling with personal demons whose origins we can initially only guess at. Why she killed Adrims and then crowed about it to Helga is left teasingly unexplored until late in the film, and what motivates her to break into Emily's shop one night and furiously destroy symbols of marriage and even a picture of Warren is clearly more than a random act of madness. Her most curious action comes when she enters Karl's pharmacy and walks up to a young boy drinking soda at the counter and almost surreptitiously touches the back of his head, which she seems almost hypnotised by. 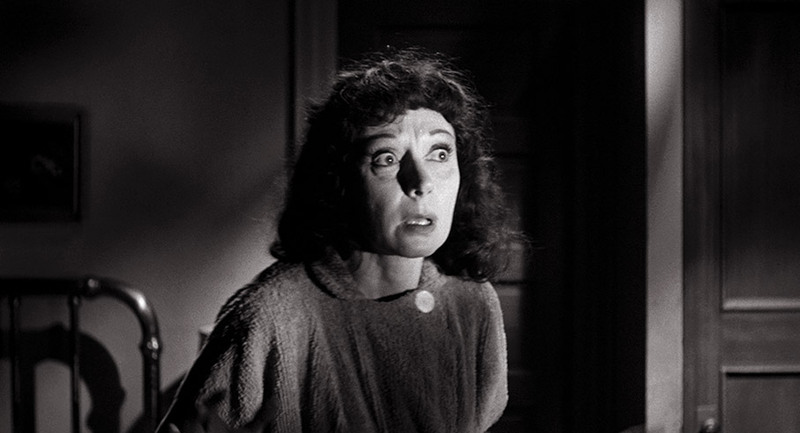 She's compellingly played by actor Joan Marshall, a TV regular in only her second feature role and who here appears under the pseudonym of Jean Arless and whose ability to come across as alluringly mysterious one minute and homicidally terrifying the next is not something that few could pull off with such aplomb. I'll also give a shout for Russian-born Eugenie Leontovich, who as the mute and wheelchair-bound Helga has to communicate her fear and desperation solely through facial expression and upper-body language, and does so with such conviction that the failure of visitors to pick up on her trauma is one of the only aspects of the film that I find just a little hard to swallow. 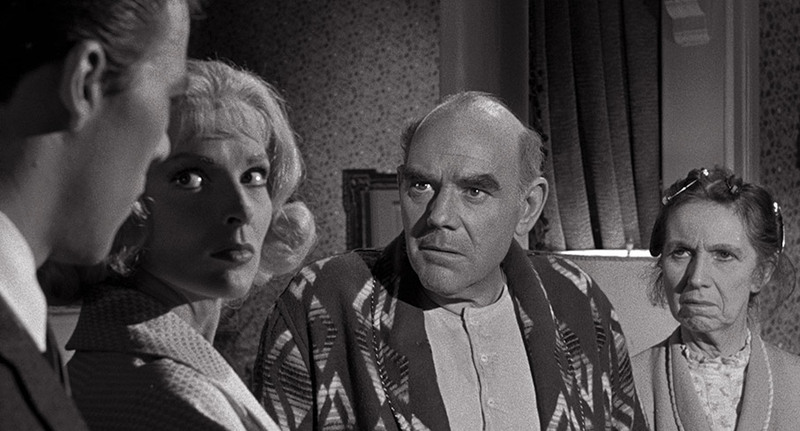 The influence of Psycho is impossible to ignore, with specific shots and even a couple of plot points lifted from Hitchcock's masterpiece of the previous year, to which Homicidal was unquestionably Castle's response (even the title announces his intentions here). But it's far more than just a cheapjack knock-off, taking Psycho as its kicking-off point and then heading in its own inventive direction, repeatedly prompting us to wonder where the story will head next and building effectively to a tense and surprising climax, which is followed by a postscript nod to Hitchcock that put a smile on my face, whether intended or not. The gimmick here comes in the form of a 'Fright Break' just before the climactic scene, in which patrons too scared to watch the end of the movie were given 45 seconds (complete with clock and Castle's voice) to run from the cinema and get their money back. This almost backfired on Castle when wily audience members would watch the whole film, then sit tight for a second screening (you could do this in the old days, even in the UK – I certainly used to) and leave during the Fright Break on the second viewing and reclaim their ticket money. To combat this, Castle introduced something called the Coward's Corner, and anyone wishing to leave and get a refund would have walk up to it, sign a paper acknowledging their cowardice and then stand there to be mocked by their fellow patrons as they left. Once this was introduced, few were bold enough to take Castle up on his offer. How could you not love this man? Once again, the 1.85:1 1080p transfer is in fine shape here, rendering picture detail clearly and boasting a good tonal range that gives way to deep blacks when required, important for a film that plays almost noir-like games with light and shadow and whose night exteriors were actually shot at night rather than unconvincingly processed to look that way. Some of the exterior location shots feel a little lacking in brightness and punch, but given that this is not an issue elsewhere we can presume this is how they were originally exposed. As before, dust and other sundry wear and tear have been almost completely eliminated. Another solid Linear PCM mono 1.0 soundtrack with clear reproduction of dialogue, effects and music and no evidence of distortion or damage. The expected English subtitles for the deaf and hearing impaired are present and correct. Film historian Lee Gambin reveals up front that he's a massive William Castle fan and he's not being remotely hyperbolic here. His enthusiasm is breathless and there are plenty of interesting observations made (several of which are echoed by other extras on this disc), but he does fall victim to one of the most annoying film commentary ticks – one usually practiced only by the filmmakers themselves – by prefacing so many of his comments about the on-screen action with the words, "I love this/that…" to the point where I found myself struggling to stay with him. I should emphasise that this is a personal gripe – albeit a long-standing one that I've groaned about before – and that others may well have no issue with this. Good luck to you. There's still good stuff here, including a detailed examination of a key aspect of the film that I can't reveal without delivering an almighty spoiler, and I did break out a smile when Gambin exclaimed joyfully, "The violence comes out of nowhere and it's fantastic!" Laws is back to recall when he first saw the film, outline the elements borrowed from Psycho (which are usefully illustrated with side-by-side clips from both films) and talk about Joan Marshall's central performance, the Fright Break, the use of shadows in the climactic scene and more. Another of Jeffrey Schwarz's 4:3 framed DVD featurettes that provides an overview of the film and is built around interviews shot for his documentary. It's an engaging watch that includes footage from the film's Youngstown premiere, but the film's biggest twist is openly discussed, so I'd steer well clear of this until you've watched the film. A newsreel piece on the film's Youngstown premiere, excerpts of which appear in the above featurette. Much of the running time is devoted to William Castle interviewing satisfied customers after the screening, and at the end he turns to the camera and says, "Please don't reveal the ending of Homicidal to your friends because they will kill you. And if they don't, I will." Indicator has wisely not used the full official title on their extras menu for this 4:3-framed extra, which is Bob Thomas Interviews William Castle. Great! An interview with the man himself. Well, no. What we get instead is entertainment journalist Bob Thomas reading an article out loud that he wrote some years ago in which he spoke to Castle. The content is of interest, but this is still a little odd. A self-explanatory extra for those who like that sort of thing. A terrific graphic of a knife-wielding woman encircled by what looks like demonic thorns bookends this typically playful trailer in which Castle somewhat irresponsibly advises, "If Homicide is your hobby, may I recommend a surgical knife for a nice clean, quiet murder." 39 slides of promotional stills and other press material. First up, we have a detailed essay on the film by Rebecca Nicole Williams and elaborately titled What Happens in Denmark Stays in Denmark: Down the Warren of William Castle's Homidical, which includes extensive coverage of an aspect of the film that should not be read in advance by those new to it, but thoughtfully contains a big and bold spoiler warning before getting into danger territory. Another sizeable extract from Castle's autobiography focuses on the production and promotion of the film and has a whacking great spoiler in the very first paragraph. Next up, we have information on the Fright Break and the Cowards Corner, and a small collection of contemporary reviews, one of which gives the big twist away. Oh, just leave the booklet until after watching the film. In 1880 London, noted physician Sir Robert Cargrave has made his name by developing a special form of massage that enables him to restore movement to previously immobile limbs. After another successful treatment, he opens and reads a hand-delivered letter, then abruptly cancels all of his appointments for an indefinite period and heads off to the central European country of Gorslava and the stately home of the mysterious Baron Sardonicus. Why the urgency? Well, the letter requesting his presence was not from Sardonicus but his wife Maude, a former sweetheart of Robert's whom he is still devoted to. 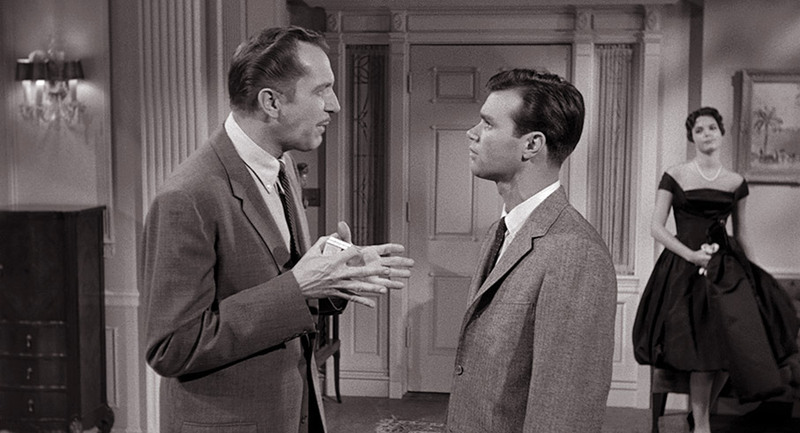 He is greeted on his arrival by Sardonicus's manservant Krull, and when he reunites with Maude, she initially confuses him by downplaying the urgency of her letter. But what of Sardonicus? When he does finally appear, his face is hidden behind a featureless mask, shielding a horrifying condition that he hopes Robert and his ground-breaking massage technique will be able to cure. What may not be apparent from the above outline but immediately hits you when you watch it unfold is how close the setup is to that of a certain genre-defining vampire tale. Indeed, the similarities to Dracula are initially so numerous that it's almost a surprise when the film deviates and goes its own way. In common with the novel's Jonathan Harker, Robert travels to a distant Eastern European location at the request of a mysterious nobleman whose name strikes fear into the only local man that he speaks to. Although an onsite manservant here, Krull is effectively a Renfield stand-in, and in common with Dracula's castle, the Baron's mansion is bereft of mirrors. There's even a vampiric aspect to Robert's arrival, when he discovers that a maid is being tortured by having leeches attached to her face, an experiment apparently ordered by Sardonicus that Krull treats almost as an amusing pastime, one that gives rise to one of the film's most perverse and startling scenes. There's an argument – admittedly one I've just made – for seeing Mr. Sardonicus as Castle's equivalent to Roger Corman's Poe films, a classy and seriously toned gothic horror-drama that absolutely did not need the late-film gimmick that Columbia apparently insisted be included (I'll get to that in a minute). From the moment Sardonicus first puts in an appearance we know that sooner or later we'll get to see what lies beneath his mask and it doesn't disappoint, a grotesque skeletal grin frozen in place by a traumatic incident in the Baron's past, which is outlined in compelling and appropriately creepy flashback. A strong and committed international cast really helps here, all of whom treat even the more extreme elements of the story as seriously as they would a prestige costume drama. Fresh from Hammer's Scream of Fear and Stop Me Before I Kill!, Ronald Lewis makes for a convincingly principled and studious Sir Robert, and although trapped behind a mask or face-freezing make-up for much of the film (this is not a spoiler, as his unmasked self is featured in the flashbacks), respected stage and screen actor Guy Rolfe – who had also recently worked for Hammer in Yesterday's Enemy and The Stranglers of Bombay – conveys Sardonicus's torment and penchant for pragmatic cruelty without overplaying or hamming it up. Best of all, however, and quietly stealing almost every scene he appears in is Viennese actor Oskar Homolka, who puts his distinctive face and voice to excellent use here and brings an everyday, almost offhand edge to his line delivery that rarely feels like acting at all and peppers his performance with small but wonderfully judged bits of business, some of which suggest interesting stories of their own. So what of the gimmick? Cheerfully introduced before the film gets under way by Castle on the bank of the River Thames (yeah, right), the Punishment Poll could well qualify as the biggest con of Castle's colourful career. On the first-run screenings, cards were handed out to the audience containing a luminous drawing on a hand in that position we used to adopt to flag down cars when it wasn't too risky to hitch a lift. As the film draws to a close, Castle reappears and asks the audience members to hold up their cards with the thumbs upwards or downwards depending on what fate they wanted to impose of on a key character in the manner of a Roman nobleman at the Colosseum, the story being that the film had two endings and that they were in a position to choose which one they wanted to see. Which was, of course, complete hogwash. The manner in which the film's story plays out meant that the majority of the audience was always going to choose the same option, and that was the only version that was filmed, something given away by the fact that the on-screen Castle looks out into the audience and pretends to count the cards. Despite being foreshadowed in Castle's opening address to camera, it's arrival at the end of this gripping and well-crafted drama comes as something of a disruptive jolt, and it's easy to see why he had originally not planned to include it. What ultimately prevents it from doing the film any serious harm is Castle's delightfully playful delivery and the fact that the ending we are conned into thinking we have chosen really delivers, thanks again to the talent and commitment of the featured actors. It's a solid conclusion to a film that really does show that Castle was more than just an inventive showman, and possibly my favourite film in this set. A clean, crisp and vibrant 1.85:1 1080p transfer that looks particularly good in brightly-lit scenes (of which there are many) but also survives that most vigorous of test for digital transfers by rendering the dry ice in the flashback graveyard scene cleanly and without a trace of digital artifacting or banding – indeed, the film is at its most visually captivating and overtly gothic here. Dark shadows are rendered as such with no greying-out of the beefy black levels but no sucking in of surrounding detail either. The film grain is at its finest here, and overall this is probably the best looking off all of the films in this set. Just. The Linear PCM mono soundtrack is as robust as the other tracks in this set and with similar minor limitations on the dynamic range. Again the music sounds particular good and any distracting wear or damage has been cleaned up. English subtitles for the deaf and hearing impaired are also present. Given that Mr. Sardonicus is William Castle's most gothic film, I shouldn't have been surprised that Kat Ellinger was drafted in to do a commentary, here joined by her fellow Diabolique Magazine writer (and associate editor) Samm Deighan. 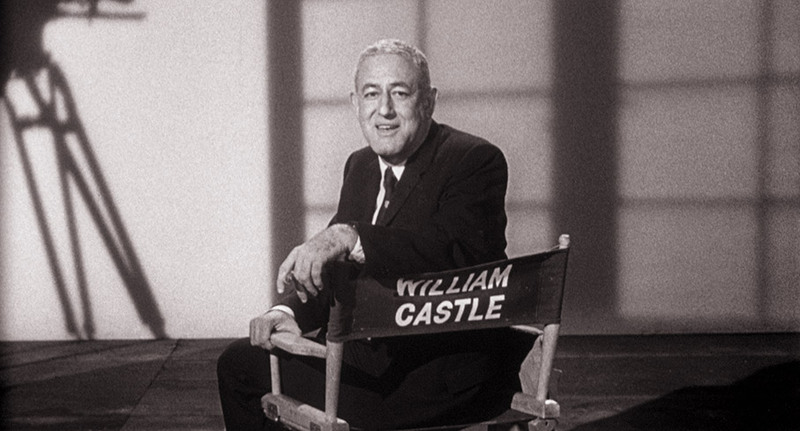 Both are enthusiastic fans of the film and have lots to say about it, but even more to say about William Castle, whose work as a filmmaker and showman they discuss at considerable length and in enthralling detail. They suggest that the film is a direct response to Hammer and a re-interpretation of British Gothic, reference a ream of other works that scenes and even themes remind them of (these two really know their stuff) and describe the film at one point as a dark fairy-tale and a warning fable. There's loads to absorb and appreciate here, all of it worthwhile. Indicator regular Jonathan Rigby takes a detailed look at Mr. Sardonicus and discusses a number of things relating to it that are also touched on elsewhere in this set, including the origins of the project, the structural similarity to Dracula, its gothic elements, and plenty more. Given that the original story was titled simply Sardonicus and the title character has bought his way into the aristocracy,he pertinently wonders why the title wasn't changed to 'Baron Sardonicus' rather than Mr. Sardonicus. He also highlights small things that don't gel with the 1880 setting and even has a couple of suggestions for improvements. Feel free to disagree. An interview with Castle's friend and business associate Richard Kahn, presumably shot for the Spine Tingler! 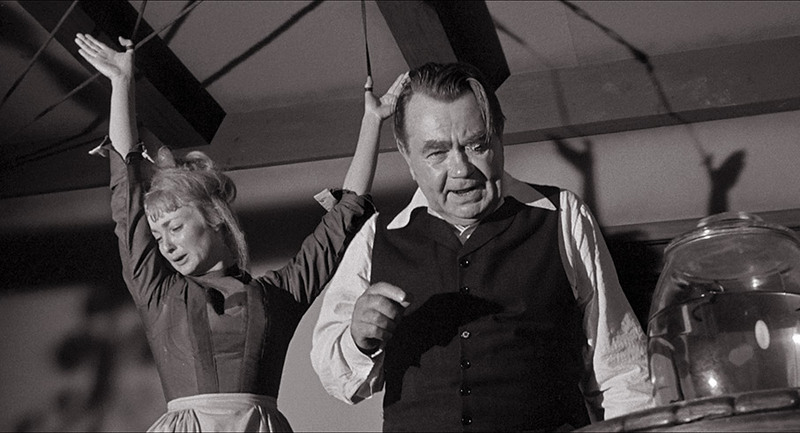 documentary, in which he talks about the Punishment Poll gimmick used for this film and how Castle was influenced by the success of the TV series Alfred Hitchcock Presents. The last of the DVD featurettes from Jeffrey Schwarz has the usual suspects talking about the origins of the film and, inevitably, the Punishment Poll (Bob Burns still has the card, which is smaller than I expected). Amusingly, David Del Valle suggests that this is the film that "put leeches on the map." I thought that was The African Queen. Introduced by Castle, who first appears in Hitchcockian silhouette with his trademark cigar and outlines the nature of The Punishment Poll with cheerful dishonesty. A better trick is his refusal to show the face of Baron Sardonicus because of the effect it might adversely affect some audience members. Re-Animator director Stuart Gordon provides an intro and commentary on the trailer, describing Castle a tad unkindly as "the poor man's Alfred Hitchcock" and revealing that when he asked Guy Rolfe if they had really shot two endings for the film, "he looked at me as if I were the biggest idiot who'd ever been born." 50 slides of promotional photos, press material and posters. An enthralling and detailed essay on the film by Josephine Botting is followed by the final extract from Castle's autobiography, at least for this box set. I'm going to have to get my hands on a copy of that now. Next we have an enjoyable piece on the promotion of the film and a short but useful article by Jeff Billington on author of the original story, Ray Russell. Rounding things off we have extracts from three contemporary reviews. They are not exactly glowing. If you only know William Castle by reputation then this glorious box set will greatly expand your knowledge and – hopefully – your appreciation of a great showman who was also one hell of a storyteller. If you're already a fan then this is a dream come true. 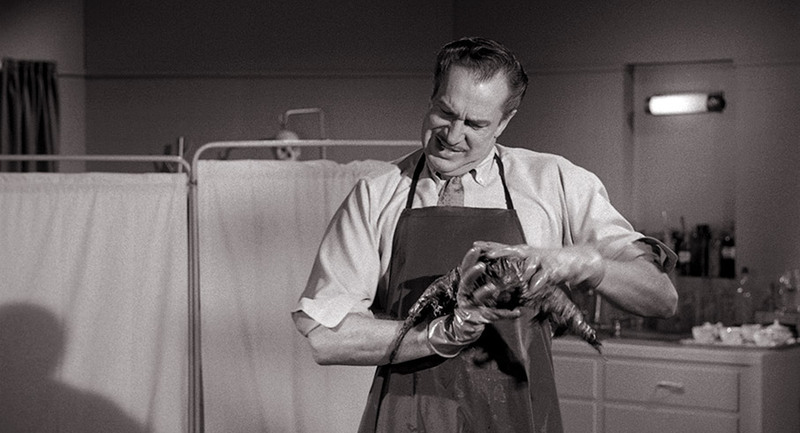 It's been many, many years since my only previous viewing of The Tingler and the other three films were all new to me. Watching them and the epic collection of special features that this box set has to offer (the Spine Tingler! Documentary, complete with commentary and making-of featurette, could justify a stand-alone release) was a bit like opening an interesting-looking old box to discover that it was actually a treasure chest of hugely entertaining cinematic treats. 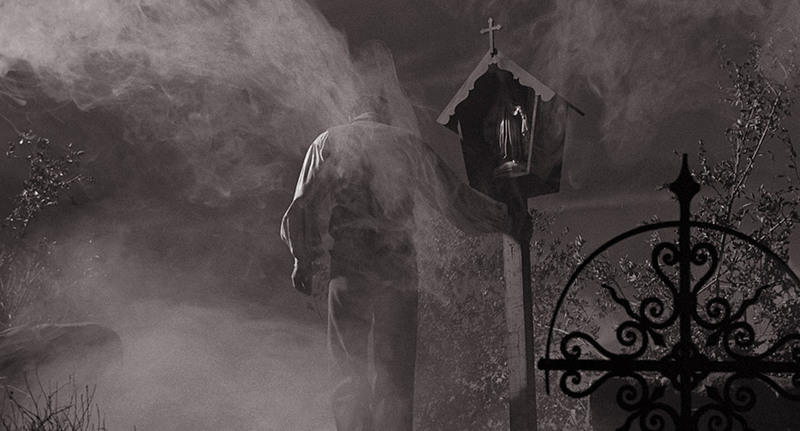 In an ideal world, I'd love to have seen the set come with physical reproductions of the Ghost Viewer and the Punishment Poll card, and even a form for us to sign to acknowledge that we are cowards, but do realise the cost and logistics of such a venture are not really feasible for an independent label, and it did prompt me to make my own Ghost Viewer and jump around in delight when it actually worked. This is another wonderful box set from Indicator, one that celebrates the work of a true cult filmmaker in real style. Roll on Volume 2. Highly recommended. Jeffrey Schwarz and Terry Castle commentary on Spine Tingler!